Fold up beds, sometimes written as “foldup beds,” and more often called Murphy beds, are an inexpensive way to add more potential bedrooms to your home, even in rooms that aren’t designed to be bedrooms. They can help you save space, and are a unique and ideal option to have in your home for unexpected guests, for example. However, they also have some drawbacks. Is a fold up bed right for your home? Find out more in our quick guide to fold up beds! What is a Fold Up Bed? First, it’s important to understand what we mean by the term “fold up bed.” Specifically, there can be confusion over what kind of bed design this term is actually referring to. A fold up bed also called a Murphy bed in the US and Canada, is usually a bed that is hinged on the wall side. It is designed to raise up (from the horizontal when in use to the vertical when not in use) and tuck into the wall, a cabinet, closet, or alcove when not in use. It does not typically refer to rollaway beds or cots, fold-out couches, or futons, which serve similar purposes and have similar benefits but are distinctly different classes of beds and furniture items. This is despite the fact that all could rightly be called foldable beds. Both brick-and-mortar furniture stores and online retailers or catalog companies offer fold up beds, to varying degrees. Below, we highlight some of the top online retailers that sell fold up beds, and what they offer or what sets them apart from the competition. Wayfair is a prominent online source of home furnishings and furniture items in the US. With free shipping and a focus on furniture and furnishings, Wayfair offers a fairly large selection of items, including fold up beds, for every taste and budget. Pricing is generally reasonable, with higher-end options available at correspondingly higher prices. Amazon boasts that it has everything on Earth from “A to Z,” but the selection of larger home furnishing items remains a bit underwhelming in that regard. While there are several choices, they don’t compare to Wayfair or some national or regional retailers’ online catalogs. This is likely due to the impractical nature and prohibitive costs associated with shipping something as large as a bed, even in a disassembled state. 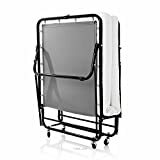 Still, with that said, they have several options of fold up beds to choose from, and prices are consistent with Amazon’s regular range, from affordable to higher-end depending on what you choose. eBay probably has some of the smallest selections of beds that fold up. Primarily, the online marketplace earned a name for itself as a place for people to sell collectibles – a kind of online garage sale of sorts. Over the years they have added more new merchandise options, from manufacturers and re-seller marketplaces that offer closeouts, overstock, and similar merchandise, brand new, at a discounted price. While the selection is limited and hit or miss depending on what’s available at any given time, the prices are very low, so it’s worth checking out. Walmart is known for low prices and a wide range of merchandise, and their entire catalog is available online (along with some third-party marketplace suppliers). While not primarily a furniture store, they still have a good range of furniture and home furnishing options to choose from. 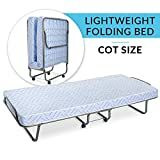 You may be able to find several different options of fold up beds available, depending on Walmart’s presence in your region, as well as the regional and local suppliers that sell through Walmart’s marketplace. IKEA is all about furniture, as one of the biggest furniture retailers in the world, and that dominance extends to their online site as well. A full range of furniture options, from their signature put-it-together-yourself style to more up-scale, solid-body designs are all available. Prices are consistent with the style and type of item you buy, with bargain/affordable choices through more elegant and upscale designs that naturally come with a higher price tag. What are the Benefits of Having a Fold up Bed? Fold up beds are great in that they are very convenient to have around, and don’t take up much space at all when not in use. They fold up into the wall, a closet, or cabinet and are out of sight, out of the way, and unobtrusive. This means it’s easy to have an extra bed in your home, without utilizing a bunch of floor space for it when it isn’t used 95% of the time or more. At the same time, they tend to be extremely low-cost, but are more substantial than futons, fold-out couches, rollaway beds, or air mattresses. Fold up beds are basically the ideal compromise between those kinds of beds and a traditional, permanent fixture bed. You’ll want to spend a bit extra to make sure the fold up bed you purchase will be comfortable and durable enough to last a long time. Brand reputation also comes into play here. The mechanisms for folding up and storing the bed should be easy to use and reliable, so you don’t have to deal with a bed falling out of the closet or wall unpredictably. You should choose a size that is ideal based on the typical use you expect for the bed, e.g., if it’s meant for only one person vs. 2 or more people who will likely be the primary users. 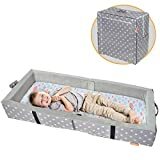 Different materials, styles, and types are available, some with integrated storage for blankets, pillows, and sheets, and others that allow for the use of a box spring, whereas some are meant as platform-style beds only. The bed, should be easy to pull down and setup, and easy to put away. 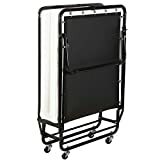 Heavier, sturdier foldable beds require more durable hardware and often dedicated cabinets or closets to fold up into. 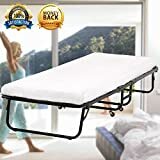 Where are Fold up Beds Commonly Used? Fold up beds can be used almost anywhere, but are ideal for spare bedrooms or spare rooms in homes where you can’t give up the floor space for a bed most of the time. This means home offices, studies, and other spare rooms are usually the places in a home where fold up beds are most commonly used. They may also be used in attics, garages, or basements that have been finished in to create more usable space. 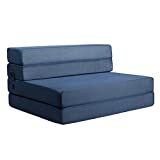 Outside of the home, fold up beds are sometimes seen in hotel rooms, dorms, and other institutional settings. They can often be found in RVs or campers, too. Not obtrusive to design or aesthetics either, being hidden in a wall or closet when folded up. Almost all fold up beds come with a permanently attached mattress and do not require a separate purchase of a mattress or a box spring. Many fold up beds are not particularly comfortable for long-term or regular use, though they are generally more comfortable than rollaways, futons, fold-out couches, and similar choices. Fold up beds are a great space-saver that can turn almost any spare room in your home into a spare bedroom when needed. They are unobtrusive and easy to store away out of sight. 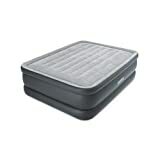 At the same time, they are a bit more expensive than some of the other temporary bed options, such as air mattresses, futons, and rollaways, but are also more comfortable for users than those choices. 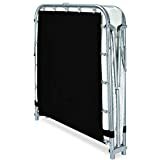 If you are considering a fold up bed purchase, be sure to look for something that is high quality, from a reputable brand, sized appropriately for your intended guest situation, and with weight and hardware commensurate with its size. You want to ensure it is durable and reliable, and easy to use so that it will last for many years.